Home/panel extenders/Do You Understand the Noise Problem? There appears to be a disconnect between what employees know to be the truth about noisy offices and what business executives are willing to admit. In a 2002 article published in Occupational Health and Safety, we see a very clear example. The author, Tiernan Carsia, points to two studies conducted by the American Society of Interior Designers. In the first one, 70% of office workers agreed that productivity would go up if noise levels were brought down. In the second, 81% of business executives reported that they are not concerned about office noise! This might be because those at the top simply don’t understand what’s going on. If they ever did work in a cubicle, it was probably before the days when the current trend for ultra-low or no dividers came into fashion. They may not realize the struggle the average office worker faces trying to shut out distractions all day long. It’s time for business leaders and decision makers to start listening to what office workers say they really need. If 7 out of 10 employees are saying they need more noise control to increase productivity, there’s probably something to it. If you’re in the position to make choices about the kind of office space your employees work in, “Designing Workspaces for Higher Productivity” is a must-read. 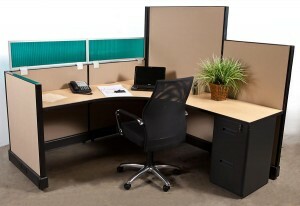 It talks about how to use multiple strategies to decrease noise in an open office setting. Naturally, cubicle panel height is a big deal. Happily, this is one thing you can easily change even after the office is fully built and furnished. Just add cubicle panel extenders!